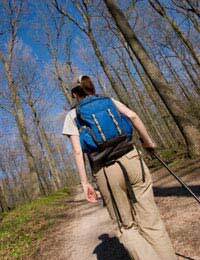 Starting out as a walker is probably one of the easiest leisure activities to get involved in. After all it’s something most of us do every day, doesn’t require any specialist skills and it’s free! There are many different ‘specialist’ activities which all fall under the umbrella of ‘walking’. There’s hill walking, fell walking, coastal walking, rambling, hiking, long distance walking and race walking just to name a few. But, in general, they’re all simply based on putting one foot in front of the other to move forward. For some, they’ll be drawn to one particular preference whilst there are others who’ll engage in several different forms of walking and others still who’ll start off with a simple stroll and will try more challenging variations later on. But whatever your choice, starting out as a walker couldn’t be simpler. You don’t have to travel very far to find places to walk – it’s literally there the moment you step outside your front door. Even in the cities there are often walking trails or you can simply devise your own route. Most of us will have a park, playing field or some woodland nearby too. If you then find that you enjoy walking, you can move on to explore other walks further afield. Perhaps, you’ve a canal towpath close by or live close to a public footpath that can lead you out into the countryside or, maybe, there’s a National Park not far from where you live. Whatever form your walk takes, you’re bound to find somewhere close by where you can get away from it all and to experience some kind of tranquil setting to enjoy observing and listening to some of nature’s sights and sounds. Throughout Britain, we are very fortunate to have some of the most beautiful, varied and interesting walks in the world. We also have very variable weather too so, if you’re starting out as a walker, you should kit yourself out with the right footwear and protective clothing to prepare you for all eventualities when it comes to the weather conditions. There are other articles on this site which give you information about the sort of different clothing and footwear items you should buy and there are plenty of other resources online too. Also, remember to take adequate food and water supplies with you too, particularly if you intend walking for more than a couple of hours. Providing you have no physical limitations, you don’t have to have any degree of fitness to start walking. In fact, many totally unfit people begin the long road back to fitness and good health through taking a regular walk as part of their daily routine. However, if you intend getting serious about your walking and have a desire to move on to more challenging walks, it’s important to increase your fitness levels gradually but steadily and it’s useful to set yourself some achievable targets to help you with that. But, don’t run before you can walk. Over-exertion can lead to exhaustion and increases the chance of you getting injured and having to give up altogether. Take your time and build up gradually. You may view walking as an activity in which you can participate with a bunch of other like minded people with whom you can share friendships with as well as enjoying a walk and that’s fine. There are hundreds of walking clubs and Rambling Association groups all over the UK and there’s bound to be one near to where you live. Alternatively, you might cherish getting away from it all and prefer to do your walking alone. That’s great too. For many people, walking alone allows time for reflection, to be at one with yourself and with nature and to forget about life’s worries in a peaceful setting. Walking is such a flexible activity and can mean entirely different things to different people. Some may prefer leisurely strolls in woodland, others may see it as a way of getting fit and losing weight. Some may prefer the exhilaration of ascending wind swept hills whilst others may prefer to walk along the coast enjoying the sights and sounds of the sea. Whatever your preferences are, there are plenty of resources out there to help you decide how you want to approach walking as an activity. It all begins with one simple step after all. Hi there, My wife is keen to take up walking so has asked for a "start up kit" for the beginner walker. I have an idea what she will need but I need advice on what are essentials and where I can get them. We live in the west of Scotland if that narrows down suppliers and various other things ie the weather. Dear Jeff, Hi there, Could you remind me of the term of that kind of walking that some people can do when they go out for a walk and the same time they enjoy the surrounding by doing reflection at once. There is a special term for that hobby. Thank you in advance. As an International Libyan student who lived in the UK in 2006-2009. I dare say that I had a very unique experience of walking in many different places over the UK. I remember that almost every weekend I used to go out for three-walk by the Clydebank in Glasgow. And I shouldn't forget the lovely moors in Huddersfield, Bala in Wels, and Of course, not to forget the city of York. As an early bird man, I really really miss the early summer mornings and the friendly people there. Plain tap water is fine. You should not need to take much...about 0.5 litre before you leave and 0.5 to 1.0 litre for during your walk unless the weather is very warm. With a walk of that short a distance, you could just make sure you drink plenty at the start and finish. The more often you walk, the fitter you’ll become and the more you’ll enjoy it. Don’t worry if three miles leaves you exhausted a first. Keep at it and you’ll soon find that level is easy and you’re ready for more. Like everything else, it takes some times and effort, but the results are great! Start out small and work up from there. If you go out to the country, stick to paths at first, and don't try to immediately undertake a 10 or 20 mile hike. Be happy with two or three miles and some glorious views (go in good weather so you're not discouraged by the rain). Don't start by buying hiking boots - for the first few walks, trainers will be just fine. If you find you want more of this, then you can look at boots and socks.